1.Navy Blue Led Safety Vests provides high visibility during the day, at night and the poor weather and keep you visible and reflective at night. Usage: For usage in a wide range of activities like motocycling, running, horse riding, outdoor riding and playing, general walking , utility workers, survey crews, railway workers, forestry workers, road construction personnel, school crossing guards, parking and toll gate personnel airport baggage handlers or ground crew, law enforcement personnel, emergency response, and accident site investigators. 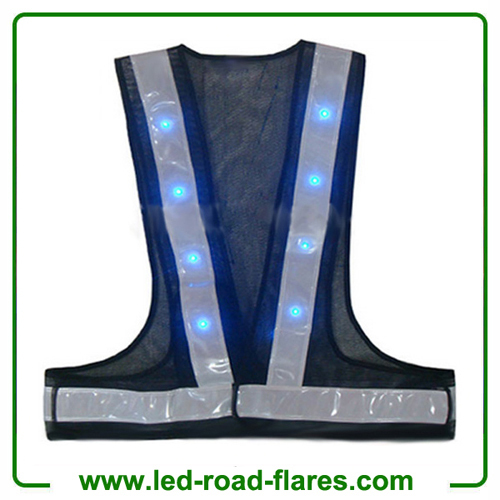 Widely used in highway, airport, port, schools, construction site, outdoor sports, etc, it is suitable for the traffic police, road personnel, environmental sanitation workers and firefighters, the lifeguard, outdoor work personnel, running in the morning exercise personnel, night work personnel, etc. weather and keep you visible and reflective at night.